Your body is made up of bones. Granted, these bones need to move-they have to be able to slide past one another or else you’d be stuck in one place. This is where the joint comes in. The two ends of where bones meet are made up of a slippery, rubbery, flexible connective tissue called cartilage. If you’ve ever eaten a chicken bone and noticed the crunchy, tasteless material at either end of the bone, that is cartilage. Problems arise when the cartilage isn’t smooth anymore. There are actually many kinds of arthritis and what it’s called depends on the type of damage to the cartilage. The most common is osteoarthritis which results from trauma to the slippery cartilage. There are many types of damage that can occur. Cracks can form in the cartilage due to lack of nutrients to maintain the cartilage and traumatic shock to the joint. Damage can also occur when the cartilage wears down and bone starts grinding against bone. When that happens, debilitating pain and inflammation starts. Bone was not meant to slide against bone. Without proper nutrients provided by joint supplements, the cartilage your joints are made of will eventually wear down. It is a slow process that leads to debilitating pain and inflammation that many seniors feel. 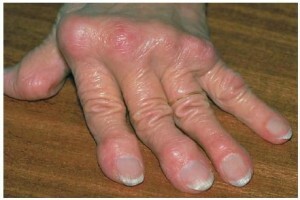 The other common form of arthritis is rheumatoid arthritis which is an autoimmune disease. This means that your own bodily defenses attack the vital cartilage in your joints. The cartilage wears away, leaving nothing to cushion and lubricate the movement of bones. Initially, the attack provokes an inflammation response which causes your immune system to attack the joint even more, but eventually severe deformity can occur! Scientists and doctors aren’t quite sure why this happens but the traditional treatments are focused on on easing the symptoms so that patients can lead a better life. Uric acid deposits can also form on the cartilage and cause what is called gout arthritis. The deposits are like adding sand to a well-oiled machine. It causes abrasion in the joint and wears away at the cartilage. One of the main reasons for gout is too much fructose consumption. Fructose activates a metabolic pathway in the liver that results in the production of uric acid. Fructose is the sugar of fruits but modern diets are high in sugar and high fructose from corn syrup. One recommendation we have for arthritis caused by gout is to cut back sugar consumption. Excellent nutritional information to be shared to all; need to be additionally presented in common terminology for those who need to hear it the most: children, young students, and all those who has not had chemistry, biology, physiology, ect. This video, explains how obesity (that usually leads to arthritis) develops from ingesting foods with ingredient high fructose corn syrup added to many carbohydrates. Those with arthritis usually do not connect their joint degeneration to their overweight/obesity problem and have a very difficult time changing their diet habits. Explanation in simple terminology of information presented will reach many more people to change their diet to prevent further damage to their joints. Trying to learn about joint supps and ran across this excellent lecture. Truly too fast and above my educational background (and age cap. 82), but I stuck with it which was unusual. However due to the subject, speaker (excellent), graphics, and the endless eye openers presented I had to stay with it. What a worthwhile presentation. If the Congress won’t do anything about this, what can we use to get a brief factual story into the hands of the American Public?